The meeting will begin with a presentation at 6:00 PM, followed by time for Q&A. The open house will begin at 6:45 PM, where participants will be able to view study materials in more detail and speak directly with members of the study team. Parking: If you would like to park in the Tower Square garage, parking will be validated at $5 per car. Meeting attendees can park on all levels but are encouraged to park on Level A. 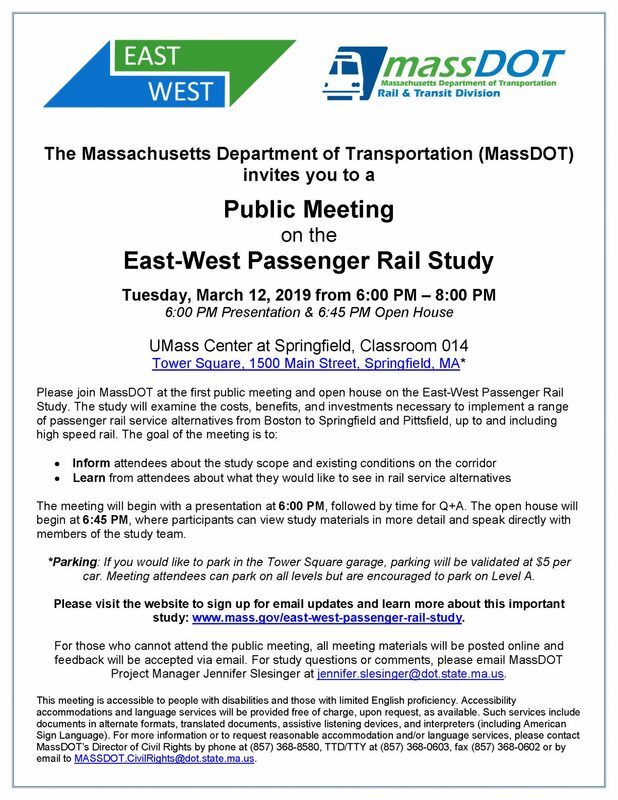 If you wish to learn more about the study before the meeting please have a look at the presentation and summary notes that MassDOT posted online after the December 2018 meeting of the East-West Rail Advisory Committee. For those who cannot attend the public meeting — all meeting materials will be posted online and feedback/comments accepted via email. If you wish to submit written comments regarding east-west rail service alternatives please email them to MassDOT Project Manager Jennifer Slesinger at jennifer.slesinger@dot.state.ma.us. Note that other public meetings will be scheduled as the study project progresses. The Recorder is reporting that Sen. Jo Comerford and Rep. Natalie Blais are two of 10 regional legislators who have signed on to a joint letter to MassDOT asking for more equitable and “fair fares” on Amtrak’s Vermonter service — and the planned new Amtrak service between Greenfield and New Haven. Fares for the Vermonter are set by Amtrak using a model they call “revenue managed pricing.” By all accounts this model attempts to set fares as high as possible — which in our view is not something that should be happening for a state-supported passenger rail service like the Vermonter. 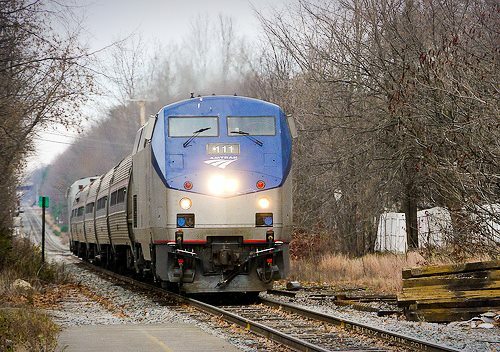 Why Amtrak is driving up the fares for travel on the Vermonter we do not know. What we do know is that it wouldn’t be possible to increase fares on the MBTA Commuter Rail system or increase tolls on the MassPike in the way that fares are being increasing on the state-support Amtrak Vermonter service. As a final note regarding Vermonter fares for today . . . the lowest available adult fare for future travel from Northampton to New York was increased in just the past few days. The base fare for this trip was raised by 8%, from $50 (the price listed in the article) to $54. Thank you Amtrak. The second concern relates to the fares for the new Greenfield–New Haven service, which starts in June 2019. These fares, according to a recent article in the Republican, may be based on the fare structure used today for the Vermonter. the fares should be set at reasonable and logical steps above the fares that both MassDOT and CTDOT agreed to when the Hartford Line service was established in 2018. We are happy to report that work has now started on the platform extension project at the station site in Northampton. Assuming the weather cooperates, this project should be complete by June of this year. 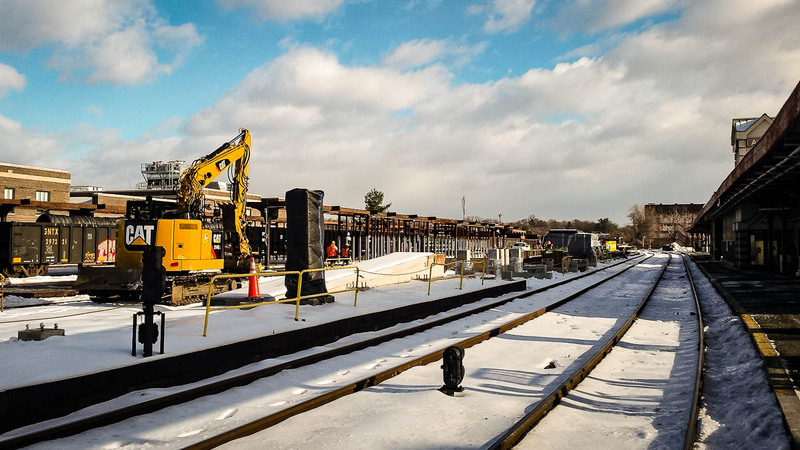 Neither snow, nor wind, nor cold seems to be slowing down the construction of a new high-level boarding platform at Springfield Union Station. The new 362-foot platform, which should be finished this spring, will allow level-boarding of two trains at the same time at this station. In other news the Springfield Redevelopment Authority has recently opened a hi-tech 950-square-foot conference facility on the second floor of Union Station. The room is available for use by station tenants and community groups at no charge. Other businesses may use the room for $75 per half day. Organizations interested in using the room should contact Ginny Averett-Kuhn, who is the property manager for Union Station, at 413-471-3397. On Monday February 11, 2019 the Palmer Town Council voted unanimously to have the UMass Center for Economic Development (CED) implement a community-informed feasibility study to support the establishment of a passenger rail stop in Palmer if/when East-West passenger rail service starts. The study will be led by UMass professors John Mullin, Michael Di Pasquale, and Henry Renski. Phase I of the project will include meetings with town officials and staff, a review of existing material, and meetings to gather public and stakeholder input into the process. This will be followed by a review of local assets, a demographic market demand study, and a review of similar rail projects. This work will result in a draft and final report to the Town Council. Phase II of the project would produce a planning study that addresses the proposed rail stop and its relations to downtown and the greater Palmer area. Phase III of the study would produce an implementation plan that addresses a range of technical, design and cost issues related to the project. The UMass CED study team will host a charrette to gather public suggestions and ideas for Phase I of the study project on Sat. March 16, 2019 from 9 am to 12 Noon in the Pathfinder Regional Tech High School cafeteria [NEW LOCATION], 240 Sykes Street, Palmer, Mass. 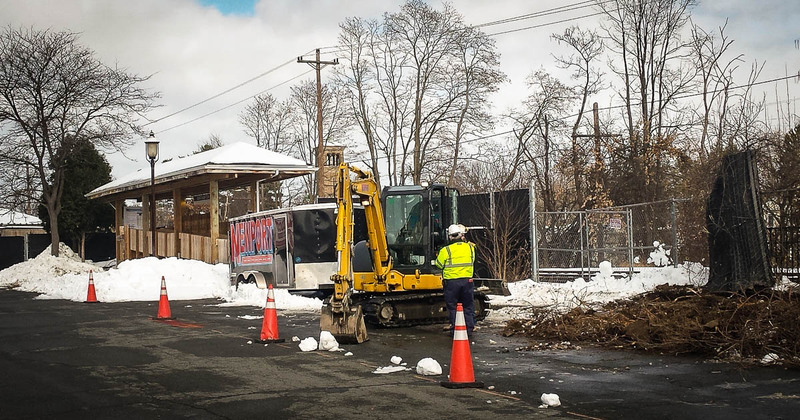 The Vermont Agency of Transportation (VTrans) has been awarded a $2 million federal grant for safety improvements along the New England Central Railroad’s mainline in Vermont. This rail line, which is known as the Roxbury subdivision, is used by the Vermonter between the Massachusetts–Vermont stateline and St. Albans, Vt. The $2,082,519 competitive grant was recently awarded under the Federal Railroad Administration’s Consolidated Rail Infrastructure and Safety Improvements Grant Program. The planned work involves moving rock ledge near the rail line at five locations, upgrading two culverts, and the installation of an advanced rockfall detection warning system at selected locations along the line. In addition to safety improvements, the project will eliminate slow orders that have resulted in 216 hours of annual passenger delays along the line in Vermont. By our calculations this works out to about 18 minutes of delay per day for each run of the Vermonter. This project in turn should result in a significant tightening of the Vermonter‘s schedule in Vermont when the project is complete sometime in 2020. On Sunday, February 3, 2019, the driver of a pickup truck lost control of the vehicle and ended up on the railroad tracks in Charleston, New Hampshire. According to media reports, emergency personnel at the scene contacted Amtrak to warn them of the vehicle on the tracks, but the call did not come soon enough. Within moments of call the northbound Vermonter hit and demolished the vehicle, sending debris flying in the direction of first responders at the scene. None of the train’s 74 passengers were injured, according to reports, although one firefighter was transported to the hospital as a precaution. What exactly happened at the scene of this accident is subject to an ongoing investigation. Media reports say that that officials on the scene contacted Amtrak to report the vehicle on the tracks. If this is true this action may have delayed contact with the crew on board the train since at this point of the journey they are only in radio contact with New England Central Railroad’s dispatchers along this line. 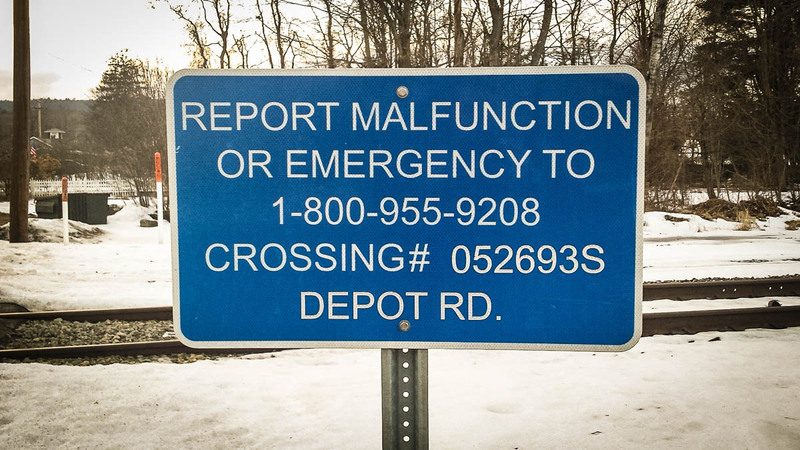 When there is an unsafe condition on the tracks find the blue Emergency Notification Sign (like the one shown above) at the crossing and call the number listed, then call 9-1-1. The number listed on the blue sign will connect the caller to the emergency operations center for the railroad that dispatches both freight and passenger trains on the rail line. 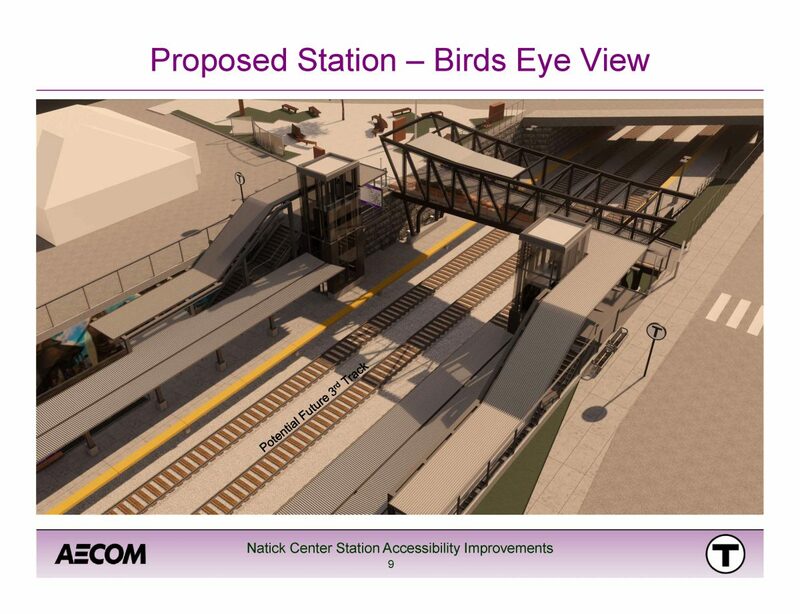 Design work is underway for a range of accessibility improvements at the Natick Center station on the MBTA Framingham/Worcester Line. When this project is complete in late 2021 the track configuration at the station will allow for room for a future 3rd track. Why do we care about this you might ask? Because MassDOT has said that the Worcester/Framingham Line is currently at capacity during certain times of the day and before East-West rail service could happen this capacity issue will need to be resolved. Leaving room for a potential future third track at this location on the East-West rail corridor is one significant step in the long road to potential East-West passenger rail service between Boston and Springfield. It is with regret that we must pass along the news that Tim Brennan, the Executive Director of the Pioneer Valley Planning Commission (PVPC), will be retiring in September of this year. It is difficult to quantify the many ways that Tim has personally impacted both passenger and freight rail service in our region over the past forty years, but we will try with a few bullets. On a personal note we will miss the wisdom, insight and direction that Tim has happily and eagerly provided to our organization over the past three years. We salute and thank Tim Brennan for the leadership that he has provided over many years as a regional champion of passenger and freight rail service for our region.